A challenge to the validity of every get was proposed by Rabbi Chisda. Since the Torah insisted that the man who wishes to divorce his wife must arrange for the writing of the get, it would seem that if the wife paid the scribe to write the divorce document it would not be effective for ending their marriage. The mishna (Gittin 22b), however, clearly states that it is the woman who traditionally takes responsibility for paying to have the get written. 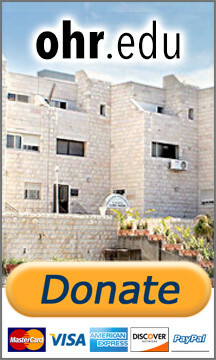 The response to this challenge provided by the Sage Rava is that the Sages utilized their power of eminent domain -- "hefker Beit Din hefker" -- to transfer ownership of the money intended for the scribe's expenses from the woman to her husband so that he is in fact paying for the writing and he is indeed giving her his get. Some of the commentaries raise the question as to how far this power of the Sages extends. The source for this power is mentioned later in our Mesechta (Gittin 35b) as a passage in the Book of Ezra (10:18). This leader of the return from Babylonian exile to Eretz Yisrael summoned all the returnees to Jerusalem to strengthen them in Torah observance. "And whoever shall not come within three days at the behest of the leaders and elders," said the proclamation, "shall have all his property confiscated and he shall be cut off from the community which returned from exile." This only indicates, however, that the Sages have the power to deprive a trespasser of ownership. It does not show that they can also transfer that ownership to someone else at their discretion although he has no claim to that property. Rashba on that gemara solves the mystery for us by calling attention to a second passage quoted by the gemara. Summing up the division of Eretz Yisrael to the tribes, we are told "These are the inheritances distributed by Elazar Hakohen and Yehoshua bin Nun and the heads of the fathers of the Tribes of Israel" (Yehoshua 19:51). What is the connection between "heads" and "fathers" asks Rabbi Elazar. This teaches us that just as fathers have the power to give away their assets to whomever of their children they choose, so too can the heads of the people -- the Sages who form the Beit Din -- give any property to the recipient of their choice. This second source, concludes Rashba, is cited to demonstrate that not only can the sages of the Beit Din deprive someone of property when they see a need for doing so but can also make someone else its new owner. This is why the money paid by the wife for get writing is considered her husband's and the get stands unchallenged. A get, says the mishna, may be written on virtually everything, even on the hand of the husband's Canaanite slave. But to affect a divorce he must present his wife with that slave as a gift so that she can thus acquire the get written on his hand. The gemara explains that he must do so because he cannot sever the hand of the slave. In his explanation of why it is forbidden to thus maim the slave, Rashi offers two reasons. One is that since a slave is obligated in mitzvot like a woman it is forbidden to harm him, as it is forbidden to harm any other Jew. This is based on the opinion of the majority of the Sages (Mesechta Bava Kama 88a) who obligate a man who physically damages another man's slave in all of the payments the Torah imposes on one who physically damages another, even for the embarrassment the victim suffers, because he is considered our "brother" in mitzvot. Rashi, however, adds a second reason. If a slave owner willfully destroys a part of his slave's body, the Torah penalizes the owner by compelling him to free that slave. From this we can deduce that he has no right to maim his slave by severing his hand. Why, ask the commentaries, did Rashi find it necessary to add this explanation if we already have a sufficient one in the gemara? It may be that Rashi was interested in showing that even in regard to a person's own slave the owner does not have, as part of his rights of ownership, the right to maim his slave even for the purpose of divorcing his wife. In regard to someone else's slave it is obvious that he may not cause him, nor any human being, physical damage. (The issue in Bava Kama is not whether it is permissible but whether the special payment for embarrassment which the Torah assigned to a Jewish victim applies to a slave as well.) Lest one think, however, that ownership is so total that when the owner has a need for severing the hand of his slave he may do so, Rashi reminds us that the penalty for such an action is loss of ownership -- a clear indication that the Torah did not give him this right.